The Scopus library database was updated on the 1st of February. This release focused on a redesign of the user interface and an update to the help functionality. 1. Improved readability of Scopus’ most-used pages with an emphasis on the most-used features. The redesign aims to make the core search workflow more efficient and streamlined. 2. Migration of Scopus Help files to a more intuitive and interactive system called SupportHub. Scopus is the largest international abstract and citation database of peer-reviewed literature and quality web sources. Scopus is multidisciplinary, covering: social sciences, humanities, life sciences, health sciences and physical sciences. It searches 45.5 million records from 5,000 different publishers. 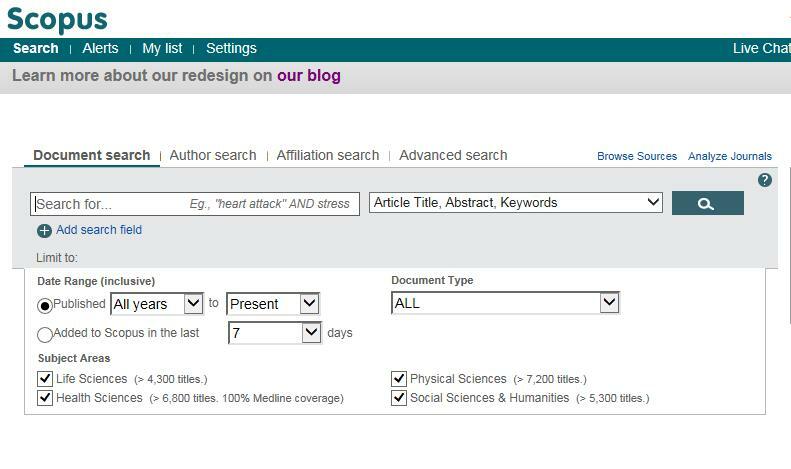 To access Scopus: within the Portal, select the A-Z list of online resources link, then choose, S and Scopus from the alphabetical list. There’s a list of Scopus training videos available from: http://trainingdesk.elsevier.com/products/Scopus.